The exterior of this unique home is almost entirely clad in golden timber. 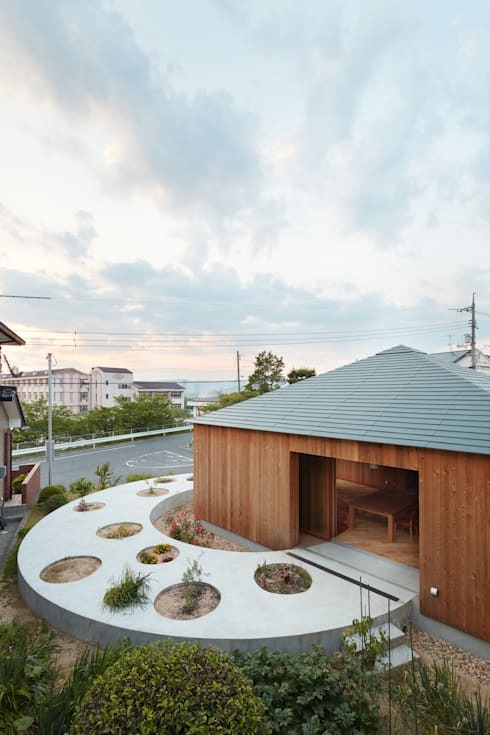 It has a modest, single level and that unusual circular concrete garden feature we mentioned earlier. It has a grounded, earthy ambience that is at one with its environment. At the same time, it also creates a striking presence amid the more conventional surrounding homes. Note how the unusual garden design eliminates the binary front or back garden option. This also affords the occupants some privacy from the surrounding homes. The unusual garden design really deserves a closer look, so let's check it out from above. 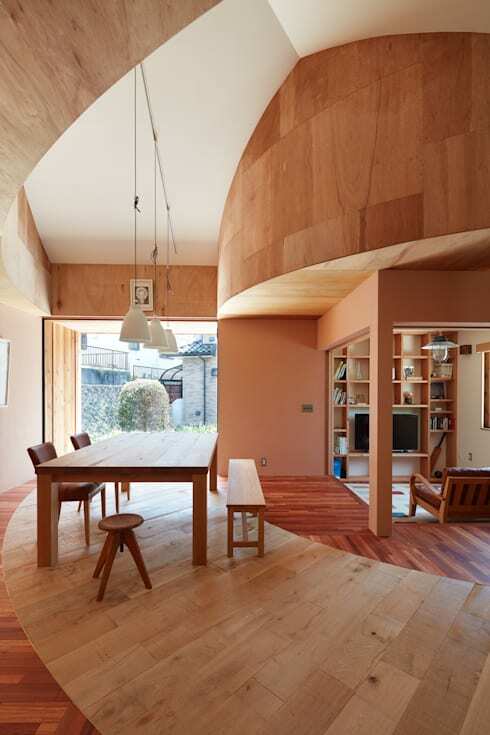 From here we can see how the circular band runs seamlessly to form the inner passageway within the home. 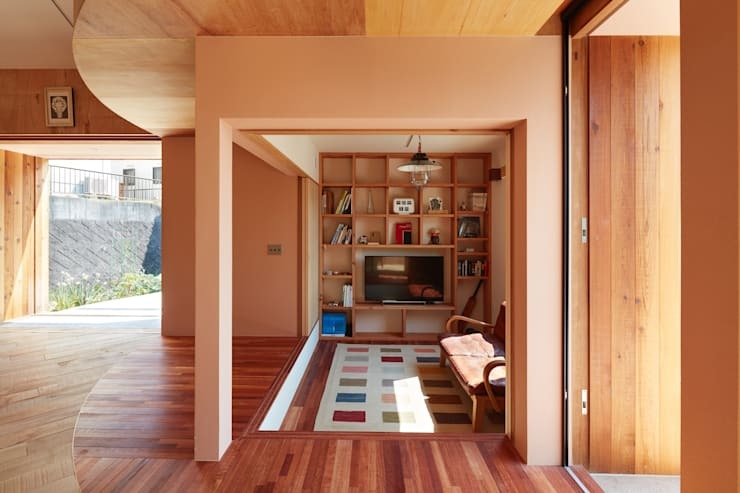 The portal between indoor and outdoor life is further blurred by the installation of large sliding doors made from wood. Check out the circular garden beds too. They certainly lighten the visual weight of such a large concrete mass. Finally, note the peaked roof that will be used to create a unique ceiling feature inside too. 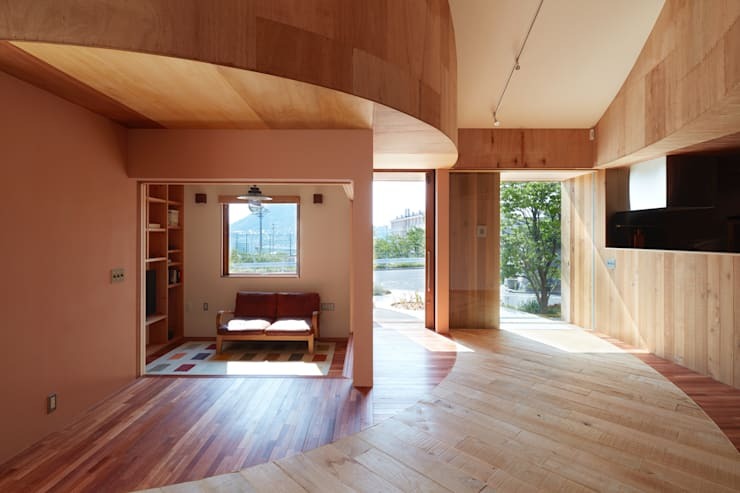 The circular motif is continued inside—albeit with a two-toned wooden floor. Circles have deep associations with organic, nature centred ideas and this is certainly a theme that suits this environmentally focussed design. Circular homes are often designed with circular living spaces, but here we have a more conventionally shaped square living room that we will explore in more detail later. Also, check out the curved suspended ceiling. It certainly accentuates the theme of the home. From this angle we can see the exit doorway of the home. We also get a glimpse of the vaulted ceiling that has been created within the centrally peaked roof space. It's all too easy to fall into familiar themes when dealing with a round home with an organic theme, but here we can see how the architects really fought against easy cliches. The conventionally shaped wooden dining table also serves to create tension with the otherwise curvy shapes in this room. It can be tricky to separate living room spaces in any open plan living space without blocking the flow of light. This is particularly true in an organically themed home like this. 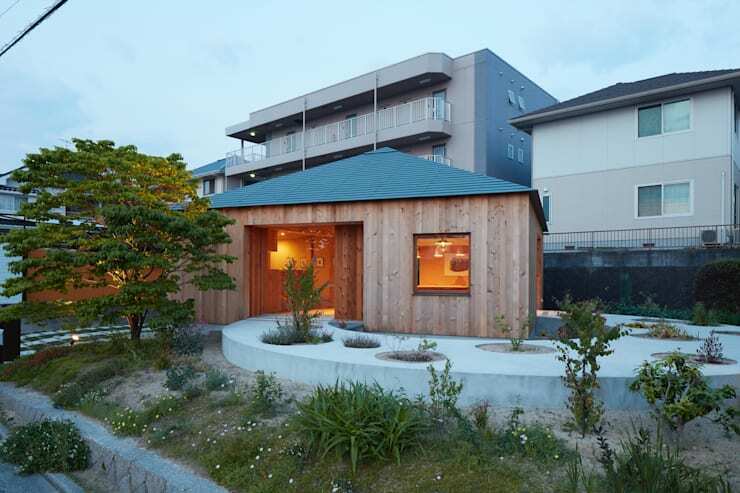 But the architects have employed a traditional Japanese approach to create this division. In short, they have created a slightly sunken floor in the living room. Also, note the built-in wooden furniture. 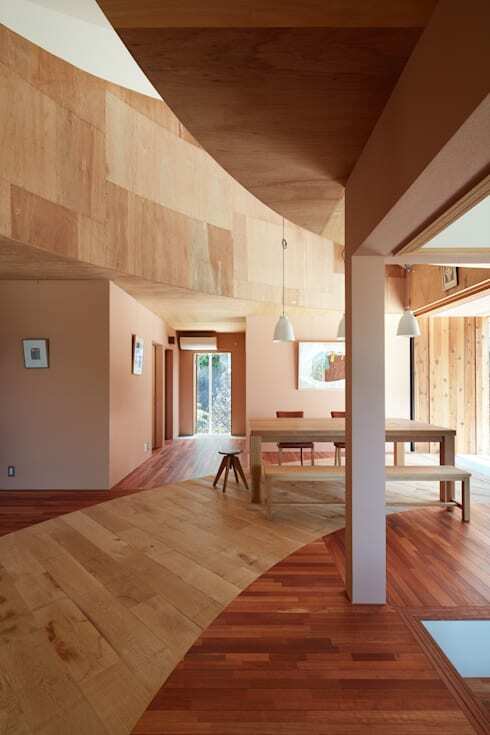 This is a home with relentless focus on natural materials! The architects created a design with a seamless transition point into the more private areas of the home. Here we can see how the hallway divides into two points that leads us to the bedrooms and other utilities. The seamless flow, of course, is created with the unifying element of natural wood. Finally, note how different these areas feel from the more sociable, open parts of the home. If this project has you excited about the possibilities of interior spaces, you'll love The inspiring makeover of a seriously tiny home. What is your favourite feature of this unique little home?